Activities by conservative Protestant groups. The conflict over Christmas in 2005 started to heat up well in advance of the holiday, as expected. Some people regard the late December season as a multi-cultural time when followers of various religious faiths and secularists -- including Christians, Wiccans, Muslims, Jews, Atheists, secularists, etc. enjoy observing their unique seasonal days of celebration. Others believe that the season should be restricted to an observance only of Christmas. 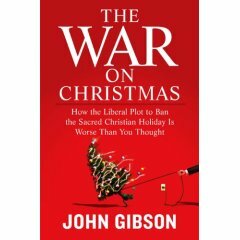 A few days later, on OCT-20, Sentinel released a book by John Gibson titled: "The War on Christmas: How the Liberal Plot to Ban the Sacred Christian Holiday Is Worse Than You Thought." In Illinois, state government workers were forbidden from saying the words "Merry Christmas" while at work. A New Jersey school banned even instrumental versions of traditional Christmas carols. Arizona school officials ruled it unconstitutional for a student to make any reference to the religious history of Christmas in a class project"
"Millions of Americans are starting to fight back against the secularist forces and against local officials who would rather surrender than be seen as politically incorrect. Gibson shows readers how they can help save Christmas from being twisted beyond recognition, with even the slightest reference to Jesus completely disappearing. The annual debate will be hotter than ever in 2005, and this book will be perfect for everyone who�s pro-Christmas." During the 2004 the end-of-year holiday season, Target Corp. refused to allow Salvation Army bell-ringers from its store entrances. Their reason was that if they allowed Salvation Army personnel to solicit donations there, they would have to allow representatives of all other nonprofits as well. The Salvation Army had to go elsewhere to make up for the approximately $9 million that they had collected from Target shoppers in previous years. For 2005, Target announced a new partnership with the Salvation Army. From 2005-NOV-25 to 2006-JAN-25, visitors to the Target web site will be able to purchase clothing, household items, and other products, and donate them to one of the Salvation Army's 13 distribution centers across the U.S. They will also be able to donate money directly to the Salvation Army. Carolyn Brookter, a spokesperson for Target, said: "We were concerned that the holiday season would be a time when the hurricane victims would be forgotten, with so much going on and so many families trying to serve their own needs." George Hood, national community relations and development secretary for the Salvation Army, said: "This will be an interesting test. If we can keep the same high-profile presence through the holiday season, as we did during the hurricane season, then it could be very productive for us." The AFA alerted its followers on 2005-OCT-07 that Target had banned Salvation Army's kettles from the front of their stores. The AFA later learned that Target would be using the term "Happy Holidays" instead of "Merry Christmas" in their in-store promotions and media advertising, presumably to recognize the religious diversity among their customers. 2 The AFA, a fundamentalist Protestant agency, found this decision unacceptable. They advocate that the holiday season in late December focus solely on Christmas. On 2005-NOV-14, Target Corp. announced that its November sales are less than projected values and will come in "below our planned range." According to the Globe and Mail newspaper, "Target's sales warning raises concerns that consumer spending will falter as consumer struggle with a backdrop of rising interest rates and soaring energy costs.....Last week, Target reported a 12-per-cent increase in third-quarter sales, its seventh consecutive quarterly gain. The company has become a favorite with investors as its sales growth has outpaced that of Wal-Mart." 3 Target shares dropped by 7%. Shares of Wal-Mart, Federated Department Stores, Kohl's, and J.C. Penny also dropped, between 1 and 5.5%. A search of the Target web site on 2005-NOV-22 showed 48,378 product matches for "Christmas." Almost all were the titles or topics of books and recorded music. The Target web site itself referred to topics like "Holiday" gift finder, cooking, entertaining, d�cor, catalogs, shipping dates, etc. and did not stress Christmas. They sell a wide variety of ornamental trees, without mentioning the term "Christmas tree." The only place that we could find on their web site where Christmas was mentioned was in the "Shop by Style" section of the Holiday Decorating menu. It had a hyperlink to "Classic Christmas." The latter section featured ten items -- topiaries, candleholders, etc. of which eight items were out of stock. The AFA asked everyone to boycott Target during the Thanksgiving Weekend 2005-NOV-25-27. This is the busiest shopping weekend of the year. They are asking their supporters to share this request: "... with friends, family and members of your church and Sunday school class." "Every year we have so much confusion that managers and school officials just censor if they have any doubt. They just remove that nativity scene or stop children from singing carols. There is such an overreaction that some school officials have banned green and red clothes because those are Christmas colors." The three main legal organizations active in preserving separation of church and state are the Americans United for Separation of Church and State, American Civil Liberties Union (ACLU), and People for the American Way Foundation (PFAWF). Rev. Barry Lynn, executive director of Americans United said that he was unaware of any lawsuit filed by any of the three groups in at least two years. He said: "They're preparing a campaign to fight for Christmas in a war that in fact does not exist. This is just one more fund-raising gimmick for Jerry Falwell." He explained that "The law is reasonable settled" as far as putting Christmas displays on public property, like city halls, fire stations, police stations, city owned parks, etc. Such a display is constitutional as long as it also contains secular elements, such as Santa Claus, Frosty the Snowman, etc. However, there is not yet a definitive U.S. Supreme Court ruling on school concerts. He speculated that a concert that contained Christmas carols such as "Silent Night" would probably be found constitutional if it also included secular songs such as "Frosty the Snowman." He concluded: "This so-called `war against Christmas' is a powerful image but it's mythological. Most public institutions understand what the law is." "Do you feel unrepresented when the loudest voices on TV try to turn simple respect for diverse religious beliefs into an attack on Christianity? Do you think the 'war on Christmas' crowd is violating the spirit of the season - and trying to create religious conflict for political purposes? Do you have an opinion on what's best about religious freedom in America? Can you record yourself on a web-cam or other digital camera?" "We are looking for a thoughtful variety of American opinions on how America works best in respecting both religious liberty and religious pluralism." 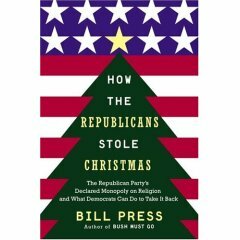 "The 'war on Christmas' claim is just the latest example of religion being used to divide Americans for political purposes. You can help us give Americans an alternative vision. "AFA 'Targets' Retailer That Won't Say 'Merry Christmas'," Citizen Link mailing, Focus on the Family, 2005-NOV-21.